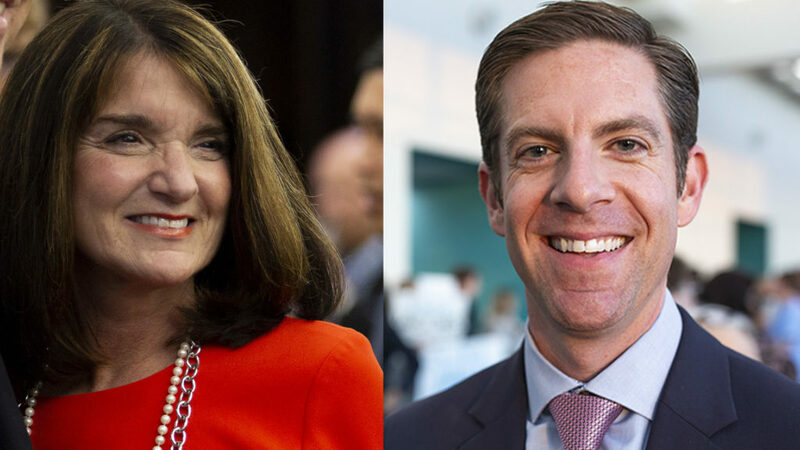 In San Diego’s most competitive races for Congress, the Democratic candidates are avoiding donations from corporations while outraising their Republican challengers. The Republicans in these races are taking corporate money, but they are trailing in fundraising by more than $1 million each. 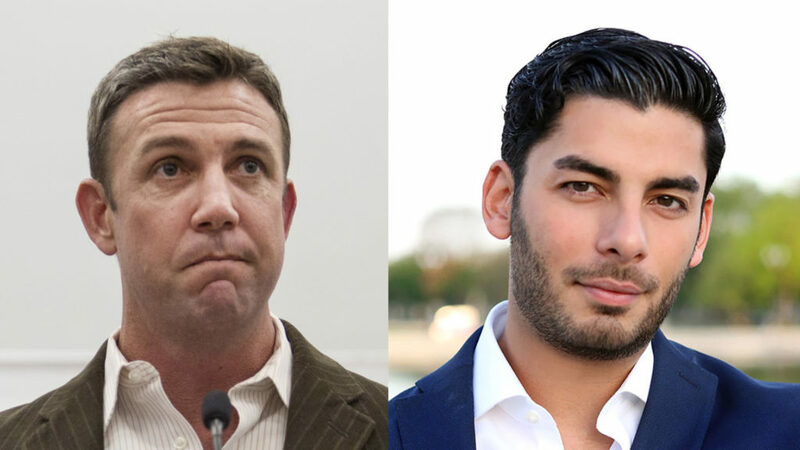 Campa-Najjar is competing against indicted Congressman Duncan Hunter in the 50th District, which includes eastern San Diego County and part of southwestern Riverside County. 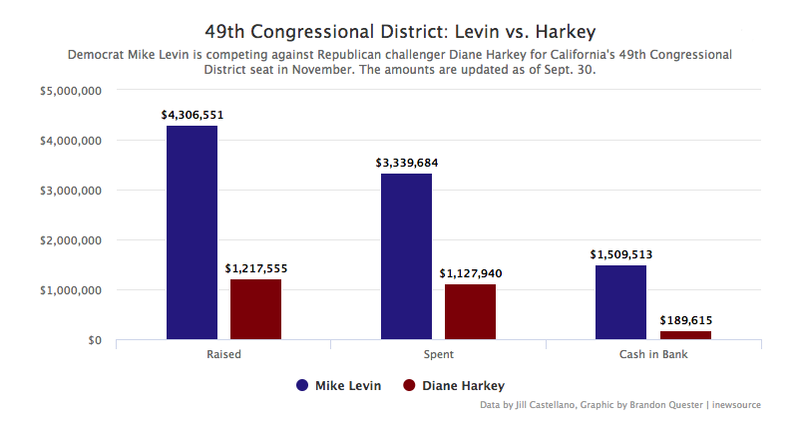 Levin faces Diane Harkey in the open 49th District, stretching from Dana Point in Orange County south to Del Mar. Under the Federal Election Commission’s rules, corporations, unions and nonprofits can’t donate directly to campaigns. But if those groups form political action committees with separate bank accounts, they can donate up to $5,000 to House candidates. Jessica Levinson, a campaign finance professor at Loyola Law School, says refusing industry donations is a growing trend. “It is politically popular to be able to say, ‘I have grassroots support. I have support from the common person. If you send me to Washington, D.C., I’m going to vote not based on what my donors want. 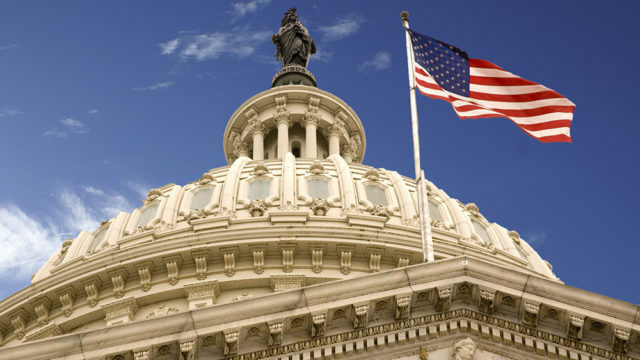 I’m going to vote based on what all my constituents want,’” Levinson said. Democrats have had their eye on the 49th District seat since the 2016 race between Republican Congressman Darrell Issa and his Democratic challenger, Doug Applegate, became surprisingly close. The seven-term congressman only won the district by 1,621 votes. Issa announced in January he would not seek re-election, leaving an open seat in a district where the number of registered Democrats is growing and registered Republicans is shrinking. Sixteen candidates competed in the June primary. Harkey finished first with 25.5 percent of the vote, and Levin finished second with 17.5 percent. A recent New York Times poll shows Levin leading with 51 percent of the vote and Harkey with 41 percent. Levin’s campaign has raised a total of $4.3 million, according to FEC reports filed this week. Harkey has raised $1.2 million. Harkey’s donors include the Automotive Free International Trade PAC, the American Bankers Association PAC and the PriceWaterhouseCoopers PAC. The NRA Political Victory Fund gave her $2,500. On the campaign trail, Levin has touted his fundraising efforts and called out Harkey for accepting corporate donations. “While my opponent is backed by powerful special interests, our campaign is fueled by the grassroots: every door you knock, every phone call you make, and every dollar you give is making a difference here in the 49th District,” Levin’s campaign wrote in a Sept. 29 email to supporters. About 93 percent of Levin’s funding has come from individual donors. Nearly a quarter of his money has come from people who have given $200 or less. In contrast, about 80 percent of Harkey’s funding has come from individuals, with 6 percent from donors contributing $200 or less. Most of Levin’s supporters donated using ActBlue, an online tool to send contributions to Democratic candidates around the country. ActBlue has raised more than $2.9 billion for Democrats since 2004. Although Levin eschews corporate money, he has accepted donations from other kinds of national PACs hoping to flip Republican congressional seats around the country, including Swing Left and the House Victory Fund. The Democratic Congressional Campaign Committee — the official political committee for House Democrats — has contributed more than $5,000 to Levin’s campaign. The National Republican Congressional Committee has donated $5,000 to Harkey’s campaign. Independent groups have also gotten involved in the race. They have spent more than $500,000 on commercials, fliers and other advertising on Levin. These groups can spend unlimited cash supporting Levin, but they cannot coordinate with his campaign. The outside spending supporting Levin gives him an advantage in the race, and that can make it easier to refuse certain sources of funding like industry donations, Levinson said. Congressman Hunter and his wife, Margaret, were indicted in August for allegedly spending more than $250,000 of campaign money on personal expenses. The indictment has opened the door for Democrats to one of the most Republican regions of California. A poll conducted from Sept. 29 to Oct. 1 by San Francisco-based Tulchin Research shows Campa-Najjar is polling at 44.4 percent. Hunter is polling at 45.1 percent. Campa-Najjar is Mexican and Palestinian-American who practices Christianity. He has renounced the actions of his grandfather, Muhammad Youssef al-Najjar, who was involved in the murder of Israeli athletes at the 1972 Olympics in Germany. President Donald Trump called out Attorney General Jeff Sessions in a tweet for not protecting Hunter from indictment in the months before the election. Trump’s presidential campaign donated $2,000 to Hunter’s re-election committee on Aug. 17. Hunter was the second Republican congressman to support Trump’s campaign for president. 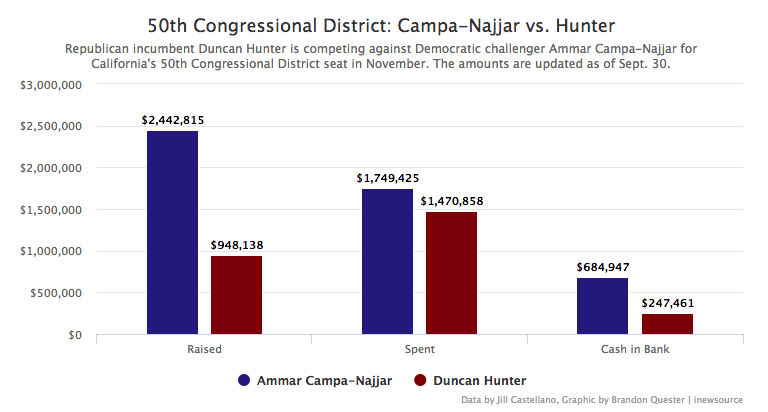 Campa-Najjar has raised about $2.4 million for his campaign, while Hunter has raised about $948,000. Like Levin, Campa-Najjar has accepted donations from national PACs supporting Democratic House candidates, including End Citizens United and MoveOn.org, while avoiding donations from industry PACs. About 97 percent of his money is coming from individual donors, with 32 percent from people contributing $200 or less. Duncan Hunter’s campaign is more dependent on PAC money: 55 percent of his funding has come from individuals and 7 percent from donors giving $200 or less. Hunter’s biggest donors include the Honeywell International PAC, the Seafarers PAC and the Shipbuilders Council of America PAC. No groups have supported Hunter’s campaign using independent expenditures. Campa-Najjar has gotten help from more than $100,000 in independent expenditures, including from the groups PowerPACPlus and Indivisible Project Inc.